Would you kill in order to win? The Games reach their climax––for some it’s a way to stay in power, for others it's just one more thing to be destroyed. With the Russian Presidential vote just a year away, the challengers need to make their move. The world will soon know who they are, as will Putin––secrecy can only hide them for a little while longer. An international lender calls in a huge bailout loan, destroying an entire Banking Union in the process. A man is gunned down in the streets of St Petersburg, his crime being he spoke to the wrong people. And a high ranking government official is murdered on the streets of London. Random? Isolated? Or an oligarch's move for power? All the while MI6 and an FSB insider gather more evidence, following hot on their heels and waiting to strike. Yet, they are up against their greatest challenge so far. From the Best Selling author of six novels, including The Tablet, comes the explosive and far-reaching third book in The Hunt series––his most anticipated collection to date! Great book continuing the series. Insightful to a culture that I assume is generally accurate. Great character development and storyline and I love that there is no fear in killing off the characters and finding new paths. It will grab you and keep you from putting it down. ★★★★★ Gripping, seamless and timely! I received an ARC of this book from the author; my review reflects my sole opinion and I write it freely. 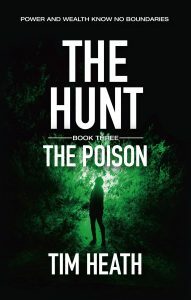 THE POISON is book 3 in THE HUNT series; it has been my privilege to read all three in order of publication. As an ARC reader, I had the opportunity to relay any questions, plot difficulties, errata, etc. to the author. First, I read for plot. I then reread, twice, for the nitty-gritty stuff. Tim Heath did not leave me much upon which to comment! The plot is easily conveyed in a smooth read and errors were notably absent. The question I want answered is, “What happens next?” Well, it would be fruitless to ask any author that question, so I refrained. Writing a review without spoilers for this title is difficult. There is a large cast of people, the action takes place in varying locations, there are good guys and bad guys, intelligence agencies, mafia, deaths, trials, plotting, planning and lots going on all over the world. There is much at stake for individuals, groups, organizations and governments. Shady deals, treachery, double-dealing and other nefarious deeds are happening all over the place. THE POISON is well-written, reads smoothly, flows from person to person and place to place without confusion. The characters have depth, descriptions are spot on, conversations are appropriate to the speakers, the plot is timely and the premise is quite believable. I am enjoying this series very much, even with having to await the next book. Each one is better than the last and Tim Heath always surprises me. This is an easy wholehearted recommendation to make. I loved it, and the two preceding in this series! Try it for yourself—you will be surprised at how much stands out from the crowd! Our intrepid band of undercover spies–Alex, Anissa, and Sasha–from MI6 and FSB continue their investigations and attempts to bring the participants in the Games to justice. We start with the challenge from the end of the previous book and work our way to New Year's 2018 as the Games participants start after their real prize–the presidency of Russia. The body count increases as the Games transform into the real hunt (for the oligarchs). Contestants from previous Games play their own parts in the evolving story. The competition against each other and against Putin is intriguing. Tim Heath takes us deeper into understanding the wealth that rules Russia and the mindset of those who have the wealth and the power. While this may be fiction, it gives us much to consider in the real world. This is the third book in the series that I've read, and like the two previous volumes, this one doesn't disappoint. It's a complex series, multiple plots and character interactions on different levels in each. It's not a book you can read mindlessly, you need to stay on your toes to keep up with it. It's fast-paced, very well written and the plot is excellent. It's also very up to date, reflecting on actual current affairs. I loved it even if I hated the cliffhanger at the end ;- ) It's going to be hard waiting to find out what happens next. Alex and Anissa are still after the rich and powerful Russians, who are still playing the game that offers some a chance at millions. Some will cost then everything. I’m assuming there will be another book in series, kinda left your hanging in end. The author did an excellent job on plot and bringing you into the story. The book was well written and entertaining and suspenseful. Received a copy from the author for an honest review and this is only my opinion. ★★★★★ Gripping story twisting story. Book 3 does not disappoint, it grips from the beginning. Twisting and turning. You think you’ve got it sorted in yr mind and it twists again. Group of mega-rich people think they’ve got the answers to everything. Have they? You will have to read it to find out. ★★★★★ My head is spinning! Such a complex web of power struggles and backstabbing, my head is spinning! I couldn't put this down and was completely drawn into this world of double-crossing and ambition. The battle for power is on and I can barely keep up! So many twists and turns and lots of loose ends that I hope will get resolved in the next series. So many characters and yet I am desperate to see what happens to them all! A very clever and original plot, indeed! The best novel yet, for sure! ★★★★★ A complex story but an excellent read. This is the third in this series I have and it didn't disappoint me! I couldn't put it down and read it in two nights! It is very up to date and very well written! A lot of the characters are from the previous books! It is a lefthander finish and I can't wait for the next one! I really recommend this book.